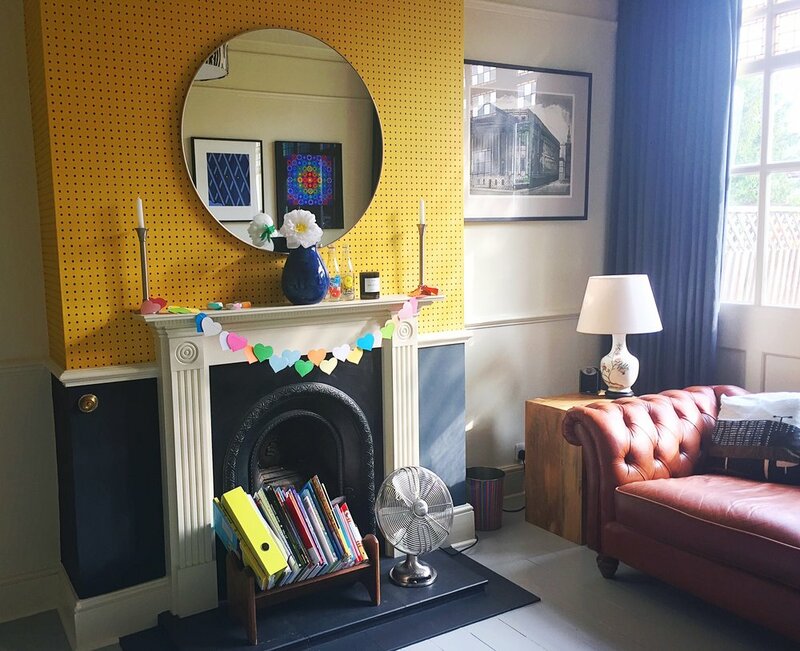 It was decorated in June, but my living room is now very nearly finished - hooray! It's quite a transfomation from the dark (albeit cozy in the winter, so let's see how that goes) room it was before. 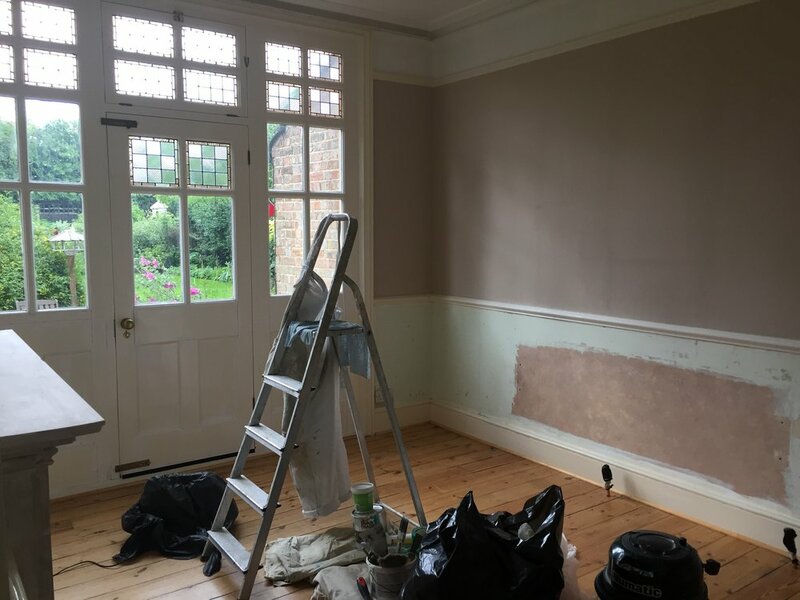 So we had a dark purple chimney breast, a pinky/grey colour on the rest of the walls (which was actually really nice but tatty), lots of orange wood, plus all the woodwork which had been painted, was painted with gloss. I'm so happy with it - I keep going in just to stare. We've decided we need to add a rug, but apart from that it's now finished. All of the walls/woodwork were painted using my favourite, Farrow & Ball (you just don't get the same finish with anything else). The off white is Lime White and the dark grey on the bottom of the chimney breast is Railings. All in Estate Emulsion and Estate Eggshell on the woodwork. The floor is painted in V33 Renovation Paint in Moondust Satin from B&Q - we were very gentle with it for the first couple of weeks, but now we're rough as anything (box of Brio emptied out onto it etc etc) and it seems to be holding up very well. 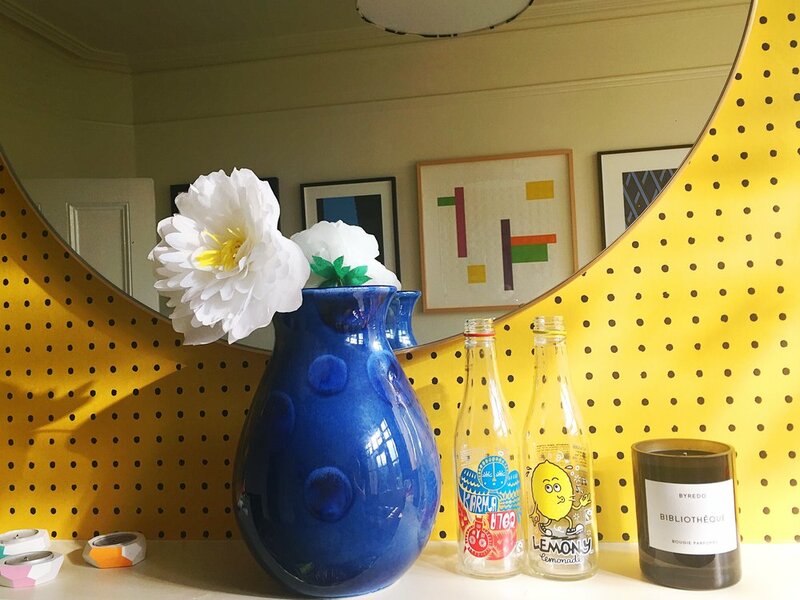 The beautiful yellow wallpaper is Peggy in Mustard from Mini Moderns. The new curtains are made to measure from Laura Ashley. Our timing was spot on and we managed to get some bargains in the Habitat summer sale. 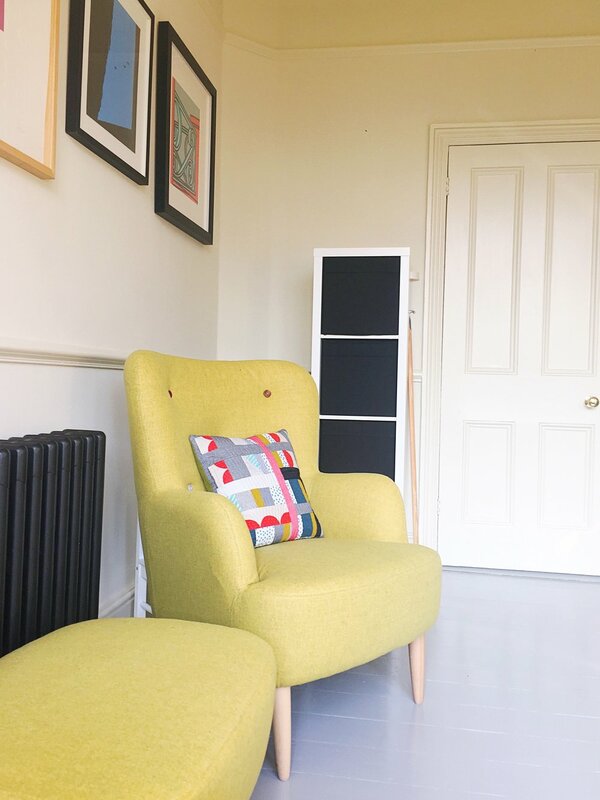 The armchair and footstool are just lovely and we also got the mirror above the mantlepiece (all now discontinued). The cushion above is by Miesje Chafer. Cushions on the sofa in the earler image are by (l-r): Me (about 5 years ago! ), Nikki McWilliams, Me (using a kit by Pom Pom Design) and Georgia Bosson. We needed to do something to tackle the toy storage situation, as previously the room was completely taken over by them and I'd had enough. About half were moved up to the little man's room and we then limited it to a new IKEA unit behind the door (see above) and the bookshelf on the hearth. The room feels almost empty and it's lovely! And finally, the icing on the cake - my beautiful lampshade by Justine Ellis. It's huge (even if it doesn't look it in this picture) - a whopping 50cm in diameter and everyone's been commenting on it. We finished it off by getting a diffuser so we don't sit on the sofa staring up at the bulb.